Shopaholics and those in need of some retail therapy will not be able to resist the latest trends featured in Shopping Spree. 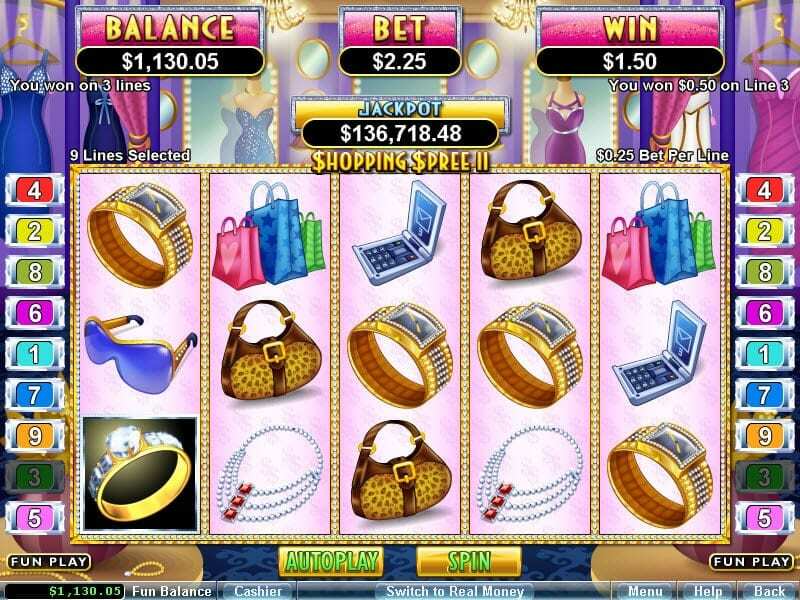 With massive progressive jackpots on offer, we are sure you’ll be shopping till you drop. Fashionistas hoping to update their wardrobe can browse designer lipsticks, pearl necklaces, chic handbags, flower baskets, and exciting mystery grab bags as they peruse the racks to see what takes their fancy. Exciting bonus rounds, generous prizes, and an ever-growing progressive jackpot ensure that you won’t just be window-shopping when it comes to this slots play! Realtime Gaming (RTG) is an online casino company founded in Atlanta in 1998. They have since moved their base to sunny Costa Rica. Exceptional expertise and a talented software team have ensured them a leading role in the industry, particularly in the last 15 years since the expansion of online gaming. This developer is popular here on Wizard, discover more casino slot games from this developer. This is a 5 reel slot from Realtime Gaming with just 9 paylines. Players can bet a maximum of 45 credits per spin if they’re in the mood for some retail therapy. You may want to check out guide for the best online slots you can play. The Scatter symbol is the glinting dollar sign. If 3 or more appear anywhere on the reels you will be rewarded with a cash prize. The dollar sign also unlocks one of the bonus games. You will be taken to a storeroom where you can choose from 16 boxes which contain prizes. You can keep accumulating prizes until you open a box with an X in it, at which point the bonus round will be over! A second bonus round is linked to the mystery grab bag symbols – in this bonus game you will keep choosing bags of random prize values until you pick a bag which will end the game. The progressive jackpot is won with the help of the glistening diamond symbol. Such perfect clarity is hard to come by, but if you are lucky enough to line up 5 of these gems on a payline you will win yourself the ever-growing progressive jackpot. 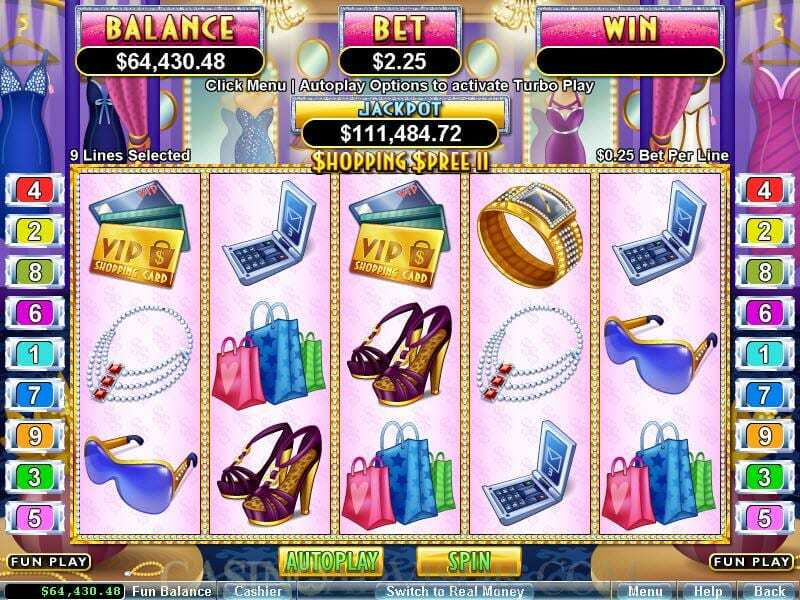 Indeed, the progressive jackpot total for this game has reached over 1 million USD – that is one hell of a shopping spree! Note that you will only be eligible to win the jackpot if you are playing with the maximum bet. If you are fortunate enough to win the progressive jackpot, you can actually choose between a $100,000 shopping spree in New York, or taking the jackpot in cash! Who could resist the allure of this shopping spree, when over a million dollars could be up for grabs?! Even if you don’t manage to lock in the elusive jackpot itself, you are guaranteed to have a great time browsing everything else this slot has to offer, thanks to the great visuals and exciting bonus rounds! The regular symbols also pay out quite generously, so the progressive jackpot certainly is not the only thing to be excited about.